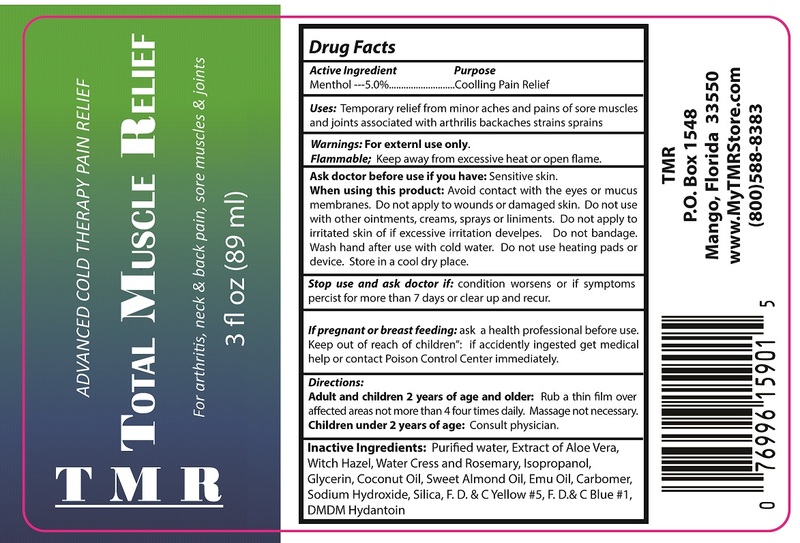 Total Muscle Relief with NDC 50130-108 is a a human over the counter drug product labeled by Electrostim Medical Services Inc. D/b/a Emsi. 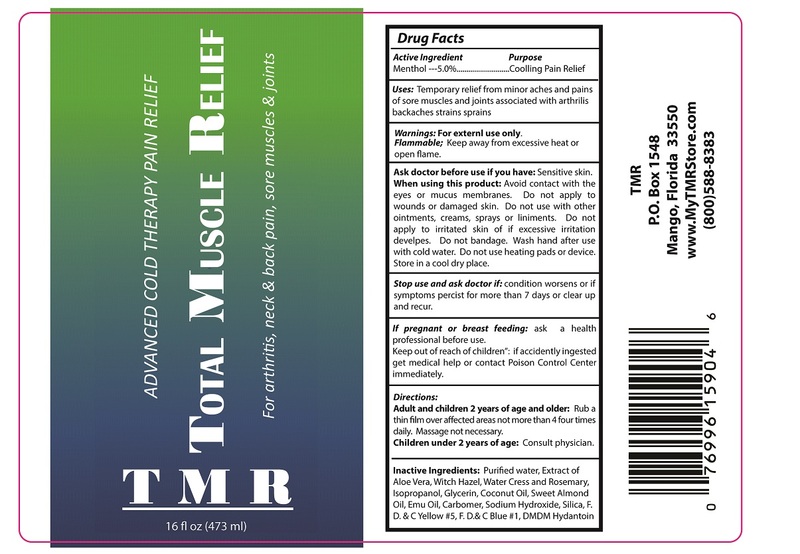 The generic name of Total Muscle Relief is menthol, camphor. 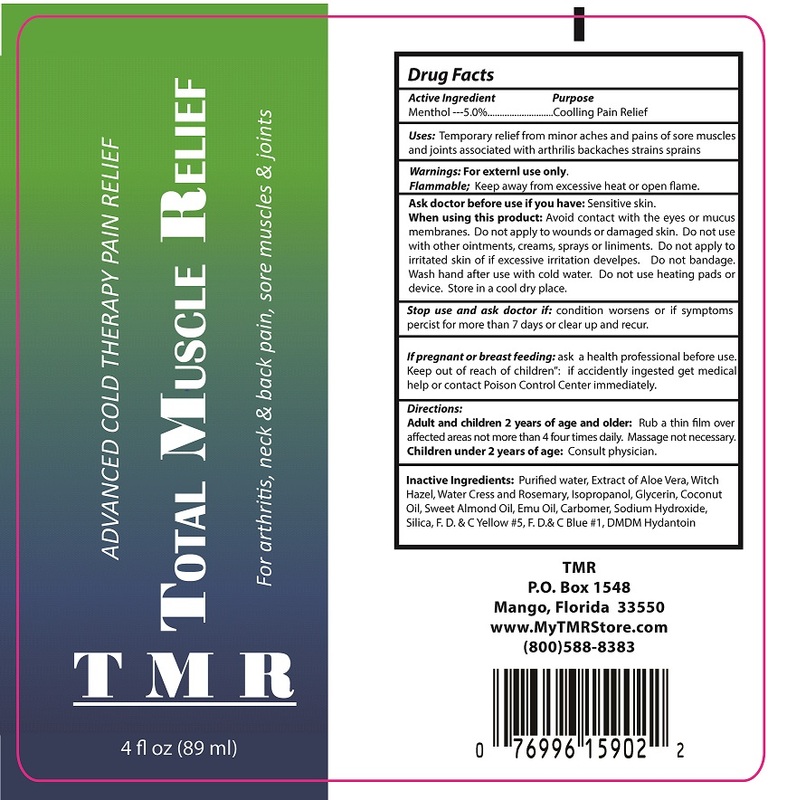 The product's dosage form is gel and is administered via topical form. FOR EXTERNAL USE ONLY.FLAMMABLE; KEEP AWAY FROM EXCESSIVE HEAT OR OPEN FLAME.Ask doctor before use if you have: Sensitive skin. When using this product: Avoid contact with the eyes or mucus membranes. Do not apply to wounds or damaged skin. Do not use with other ointments, creams, sprays or liniments. Do not apply to irritated skin of if excessive irritation develpes. Do not bandage. Wash hand after use with cold water. Do not use heating pads or device. Store in a cool dry place.Stop use and ask doctor if: condition worsens or if symptoms percist for more than 7 days or clear up and recur.If pregnant or breast feeding: ask a health professional before use. Keep out of reach of children: if accidently ingested get medical help or contact Poison Control Center immediately. ADULT AND CHILDREN 2 YEARS OF AGE AND OLDER: RUB A THIN FILM OVER AFFECTED AREAS NOT MORE THAN 4 TIMES DAILY. MASSAGE NOT NECESSARY.CHILDREN UNDER 2 YEARS OF AGE: CONSULT PHYSICIAN.